Your body whispers warnings when something is not right. Listen, listen carefully. 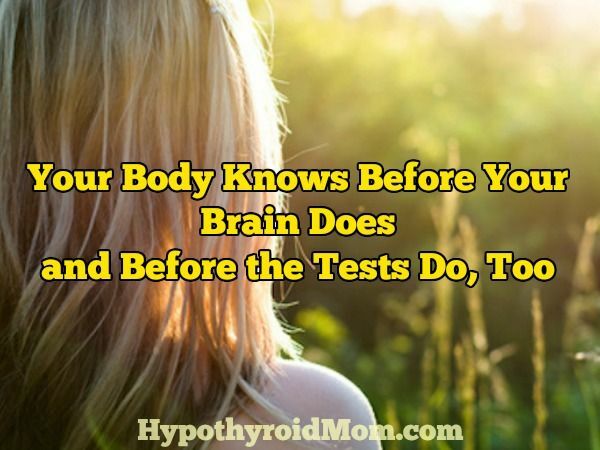 Think back to when you were diagnosed with a thyroid condition, or any health condition. Your started the appropriate medications but still didn’t feel well. Your symptoms escalated into complex conditions (fibromyalgia, chronic fatigue syndrome, dysautonomia, and the like). Your doctors wouldn’t listen, so you became your own advocate. You learned to cook. Cleaned up your diet. Took up qigong or yoga. Received alternative treatments like acupuncture or osteopathy. Healed childhood traumas. Treated chronic infections. Took vitamins and minerals and herbs. You steadily got stronger. Then, seemingly out of the blue, you had a major health setback. You’re not doing enough, the voices said. Or, You’re not doing things right. Sometimes the voices came from family, friends, and doctors. Sometimes they came from within. Last fall, I found those voices coming from within myself. I’m a doctor of internal medicine and functional medicine. I am also someone who fits the “hypothetical” scenario above to a tee. More than anyone else, I should have been able to avert a setback. What had I changed? Nothing. What had I missed? Nothing. The only conclusion I could make was that what worked for me before didn’t work for me now. My body was ever changing. My environment was ever changing, too. But where to start this time around? My rational mind was exhausted. The possibilities—infections, leaky gut, food sensitivities, mold toxicity, hormone imbalances—overwhelmed me. Up until my early 30s, I was living life at the fullest: journeying abroad for 6 months with my husband, working full-time in a primary HIV/AIDS clinic, and doing all the things I loved doing. I was exercising regularly and eating a diet of mostly organic low-fat foods. I was engaged with life and committed to living more sustainably. I felt like the world was my oyster. Living life forward, I thought I was quite healthy. Now, with hindsight being 20/20, I realize I had underlying imbalances for many years already– starting out as subtle symptoms I either disregarded or pushed beyond– that were signs of mounting inflammation and physiological stress. Because of these underlying imbalances, the stresses of a pregnancy, childbirth, and the postpartum period proved to be the tipping point for me. I was diagnosed with postpartum thyroiditis, an autoimmune condition that is not uncommon nowadays. I followed the usual course of seeing an endocrinologist and taking medication, but I remained with persistent vertigo and fatigue. Nonetheless, I was still functional, so in my doctors’ and my own opinions, I was doing well enough. Soon thereafter, a 2nd pregnancy threw me into a chronic state of severe, escalating symptoms that no one could decipher– not my primary care doctor, various specialists, my acupuncturist, nor myself. I found myself in the group of patients that either (a) was not recognized or validated by the health community, and/or (b) was not help-able. I was spiraling in a vortex of debilitating diagnoses that included autonomic dysfunction, multiple food sensitivities, and chronic fatigue syndrome. I wasn’t even sure if some of these conditions truly existed, but the experience of my symptoms was undeniable. What is intuition? The Swiss psychiatrist Carl Jung defined intuition as a method of perception drawn from inner or imaginative experiences; this was in contrast with sensing, where information was drawn from the external world. Scientists at the Institute of HeartMath define intuition as “a process by which information normally outside the range of cognitive processes is sensed and perceived in the body and mind as certainty of knowledge or feeling (positive or negative) about the totality of a thing distant or yet to happen.” In other words, an experiential form of knowing. This is the broader definition I will use for the purposes of this blog. Intuition, then, might come as a “gut feeling,” a strong hunch, or a sudden image, sound, or bodily reaction (tingling, goosebumps, or coughing fits). Intuition might also come as a dream. Those with extraordinary intuitive abilities are often called “psychic.” To skeptics, they may be deemed nothing except mad. From where does intuition arise? It has long been accepted that the left brain processes linear, concrete, and analytical thoughts; whereas the right brain processes emotions, senses, and images. Recent studies, however, suggest that the heart is also involved in receiving and processing intuitive information, and may in fact receive sensory information before the brain does. Their research also finds that women are more attuned to intuition than their male counterparts. In future research, will we discover that the gut and other organs know before the brain, too? In my medical training, intuition was never discussed. Evidence-based medicine had long been the standard, and anything beyond empirical data was deemed undependable. Invalid. Historically, however, notable scientific discoveries had come by way of intuition, many in the form of dreams. Like Mendeleev, the Russian chemist who invented the periodic table of elements. And Kekulé, a German organic chemist, who discovered that benzene was a ring structure, not a chain. Einstein famously said that intuition is a sacred gift, whereas the rational mind is a faithful servant. Our culture honors the servant and neglects the gift. Studies in the scientific literature generally advise doctors against trusting their intuition (defined loosely as “early impressions”). While robust research on this subject is generally lacking for doctors, the fields of psychology and nursing have been exploring it for some forty or fifty years. Intuitive decision making can lead to better performance than analytic deliberation alone, especially in complex situations. This makes sense, given that there’s an element of uncertainty in any given situation. One study of nurses found that intuition is naturally integrated into decision-making, and that intuition was useful in “guiding attention to relevant cues”, and thereby increasing accuracy rates. Another study reported that nurses were forced to keep their intuition secret, but that they still used it with patients. Noting this, the authors argued that intuition is an essential part of the practice of nursing. Five years ago, I was a total skeptic when it came to intuition. In fact, I would say that my “gut feeling” was to steer clear of any such practices. Then a very level-headed friend introduced me to Martine Bloquiaux, a medical intuitive who grew up in a Belgian family of doctors. As a child, Martine could read people’s bodies. It wasn’t until young adulthood that she realized other people didn’t see what she saw, and what she was seeing were disease states. Thinking I was setting Martine up to fail, I asked her to tell me what was happening with me and my utterly complex conditions. She did, organ by organ, system by system. She even told me things I couldn’t articulate but had experienced for a long time. My perception of what was possible changed. But not without a fight from my dominant thinking mind. Over time, Martine taught me to develop my own intuition. I learned this was like any other craft or art. Some are born with natural gifts and abilities, but we can all cultivate it if we practice. Last year, after years of practice, I tried my intuition out in a low-risk, high potential gain situation. My mother called because her primary care doctor had run some health maintenance labs. My mother’s hs- CRP, a marker of inflammation in the blood vessels that increases the risk for heart attacks and strokes, was extremely elevated. The other labs were fine. The primary care doctor recommended cholesterol lowering drugs, even though her cholesterol wasn’t elevated, and a recheck of labs in a few months. Not knowing what else to do, I might have recommended the same thing. Or, I might have ordered a slew of other labs in search of a source of infection or inflammation. But this time, I sat in silence and closed my eyes. What emerged was an image of my mother’s teeth. “When was your last dentist appointment?” I asked. She confessed she had two teeth her dentist wanted to pull, but she had been reluctant. I suggested she get them taken care of as soon as possible, then follow up with another hs-CRP test. A couple of months later, her inflammatory marker was undetectable. When I share this story and others with my fellow doctors, many of them feel safe to share their stories. One family doctor said he went with his clinical suspicion despite the normal screening tests and admitted his patient into the hospital. Later, it turned out the patient had a true heart event. Another doctor, a hospitalist, said she moved a patient who was supposed to be discharged, instead, into a higher level of care in the hospital, which later proved to be life-saving. Intuition won’t be accurate 100% of the time. Neither is analytical thinking. But if the advantage of having two eyes on our face is to increase the breadth and depth by which we see, why wouldn’t we use two minds to see into health matters? Last fall, when my health crashed and my thinking mind didn’t know where to begin, my intuition led me to which doctors to seek and what treatments to try. My journey back to functional has been remarkable. I encourage my patents to use their intuition, too. 1. Find a quiet space to meditate. Daily, if possible. Learning to quiet your thinking mind is the most challenging part of this process. 2. Carry a small notebook. Pay attention to sensory experiences—what you see, touch, smell, and hear. Note any special experiences in your notebook. 3. Pay attention to your dreams. Record these in your notebook, too. Note patterns, repetitions, symbols, and archetypes, not just the events of the dream. Before sleep, hold a question in your mind and invite your subconscious for revelation through dreams. 4. Ask yes/no questions and tune into your body’s signals. You may get twinges or goosebumps or another sensation. Over time, you can learn to decipher between reactions to your environment, symptoms of illness, and intuitive signals. The latter tend to be fleeting, whereas symptoms of illness to tend to last (as most of you well know). 5. Use hindsight. This is why carrying a notebook is so important. Jot down sensations, events, and images as they happen in real time, but use hindsight to discern between intuitions and random thoughts and events. 6. Be patient. Developing intuition is like learning a new language. It takes time and regular practice. 7. Have fun with this other side of you! Dr. Cynthia Li practices internal and functional medicine in Berkeley, CA. She did her medical training at the University of Texas Southwestern Medical Center in Dallas. Her practice centered around public and environmental health, with a focus on underserved communities. She worked in the HIV/AIDS division of Kaiser Permanente in San Francisco, volunteered with Doctors Without Borders at the first dedicated HIV/AIDS clinic in rural China, worked as a general internist and taught UCSF medical residents at San Francisco General Hospital and at the St. Anthony Free Medical Clinic in SF’s Tenderloin district. Do you know if it’s possible to be diagnosed with hypothyroidism and then it just cures itself? I was diagnosed with hypothyroidism (TSH was 10) about 12 years ago and was put on synthroid. I was on the synthroid for a few years and even doubled up on it when I got pregnant with my 1st child but then when I got pregnant with my 2nd child 2 years later I was told my thyroid was in normal range and no meds were needed anymore. I remember thinking that was odd but trusted my dr. and just went off of it. Well since then I have had a 3rd child (5 yrs ago) and my symptoms have been gradually getting worse with every year that passes. The symptoms started about a year after my 2nd was born but I just chalked it up to motherhood and getting older. I just had my TSH checked last week and it was 3.48 which is considered to be in “normal” range. I’m just wondering if this is common or if I should keep pushing for them to look further into my thyroid cause honestly I’m struggling so bad these days to have enough energy to just walk down the stairs and I’m feeling like it’s pushing me into a depressive state of mind even though I’m not sad or depressed. I have been under a little more stress then usual but that’s never affected me like this. I feel like I’m going crazy cause I can’t control my moods and I just want to sleep. Also my cholesterol was high about a year ago but not high enough to medicate he said. I’m only 35 yrs old and in good shape. I’m not having any weight gain or hair loss really but all the other symptoms are happening again but the weight gain and hair loss symptoms happened when I was diagnosed. Any help or advise would be so so appreciated!! Your website has been so informative. Thanks for all your doing! Does anyone else have swollen arm pits or glands? I have had them off and on. They flare and go away, i have never inquired about it happening, my GP is a bit of a dope. I need a referral to an ENDO.